1استادیار گروه تولیدات گیاهی و پژوهشکده زعفران، دانشگاه تربت حیدریه. 3عضو هیات علمی دانشکده کشاورزی دانشگاه تربت حیدریه. به‌منظور بررسی اثر شخم حفاظتی و آبیاری تابستانه بر رشد و عملکرد زعفران، آزمایش مزرعه‌ای طی دو سال به صورت فاکتوریل در قالب طرح بلوک‌های کامل تصادفی با چهار تکرار در منطقه زاوه شهرستان تربت حیدریه انجام شد. تیمارهای آزمایشی شامل اجرای شخم (به دو صورت حفاظتی و شخم معمولی) و چهار زمان آبیاری تابستانه (15 تیرماه، 15 مردادماه، 15 تیر + 15 مردادماه و عدم آبیاری تابستانه) بودند. طبق نتایج تجزیه واریانس، زمان آبیاری اثر معنی‌داری بر تعداد و عملکرد گل زعفران در سال اول و دوم آزمایش داشت. در سال اول اجرای آزمایش، آبیاری در تیر + مردادماه بیش‌ترین تأثیر را در افزایش تعداد گل، عملکرد گل و وزن خشک کلاله زعفران داشت (به ترتیب 25 گل در متر مربع، 1/12 و 16/0 گرم کلاله خشک در متر مربع). همچنین در سال دوم، بیشترین میزان شاخص‌های ذکرشده (4/127 گل در متر مربع، 4/61 و 97/0 گرم در متر مربع) در نتیجه اجرای آبیاری در مردادماه مشاهده گردید. در سال اول اجرای آزمایش، شخم حفاظتی در مقایسه با عدم شخم اثر معنی‌داری در افزایش عملکرد گل و وزن خشک کلاله (به‌ترتیب تا 3/11 و 7/11 درصد) داشت. همچنین آبیاری تابستانه و شخم حفاظتی تأثیر معنی‌داری در افزایش پیکروکروسین زعفران داشت. 1Assistant Professor of Agriculture Faculty and Saffron Institute, University of Torbat-e-Heydarieh. 3Faculty of Agriculture, University of Torbat-e-Heydarieh. In order to investigate the effects of summer irrigation and conservation tillage on flower characteristics and corms behavior of Saffron (Crocus sativus L.), a field experiment was conducted during 2009- 2010, at Faculty of Agriculture, University of Torbat-e-Heydarieh, Iran. A factorial trial based on complete randomized block design with four replications was used. The experimental treatments were all combination of summer irrigations (July, August, July + August and no irrigation) and conservation tillage (application and non- application). Based on analysis of variance, in the first and second years, summer irrigation had significant effects on number and flower yield of saffron. In the first year, the highest number of flower, flower and stigma yield of saffron significantly observed by irrigation on July + August (25 flowers per m2, 12.1 and 0.16 g.m-2, respectively,). In the second year, irrigation in August had highest significant effects on mentioned characteristics of saffron (127.4 flowers per m2, 61.4 and 0.87 g.m-2, respectively). In the first year, flower and stigma yields of saffron significantly increased by conservation tillage (by 11.3 and 11.7%), as compared to control (no conservation tillage). In addition, summer irrigation and conservation tillage significantly increased picrocrocin content. Abbaspour, M., and Sabetraftar, A. 2005. Review of cycles and indices of drought and their effect on water resources, ecological, biological, agricultural, social and economical issues in Iran. International Journal of Environmental Studies 62:709-724. Abdullaev, F.I., and Espinosa-Aguirre, J.J. 2004. Biomedical properties of saffron and its potential use in cancer therapy and chemoprevention trials. Cancer Detection and Prevention 28: 426–432. Abrishamchi, P. 2003. Investigation about some biochemical changes related to breaking of dormancy and flower formation in Crocus sativus L. 3rd National Symposium on Saffron. 2-3 December, Mashhad, Iran. (In Persian). 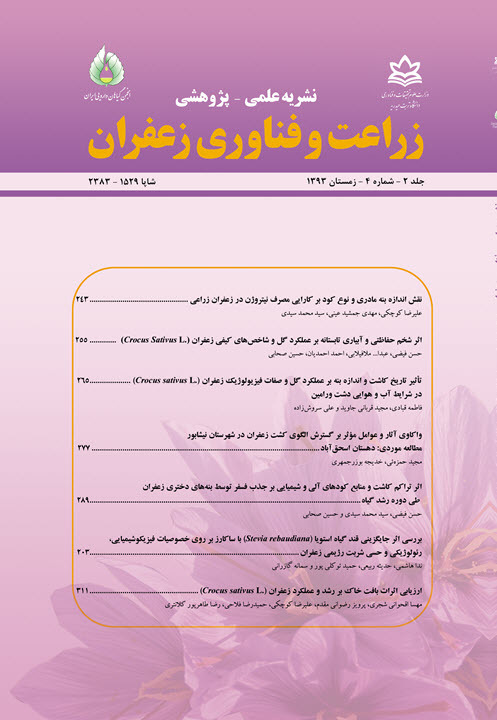 Babaei, S., Talebi, M., Bahar, M., and Zeinali, H. 2014. Analysis of genetic diversity among saffron (Crocus sativus) accessions from different regions of Iran as revealed by SRAP markers. Scientia Horticulturae 171: 27–31. Bastian, F., Bouziri, L., Nicolardot, B., and Ranjard, L. 2009. Impact of wheat straw decomposition on successional patterns of soil microbial community structure. Soil Biology and Biochemistry 41: 262–275. Escribano, J., Alonso, G.L., Coca-Prados, M., and Fernández, J.A. 1996. Crocin, safranal and picrocrocin from saffron (Crocus sativus L.) inhibit the growth of human cancer cells in vitro. Cancer Letters 100: 23–30. Koul, K., and Farooq, S. 1984. Growth and differentiation in the shoot apical meristem of saffron plant. Journal of the Indian Botanical Society 63: 153–169. Kumar, R., Singh, V., Devi, K., Sharma, M., Singh, M.K., and Ahuja, P.S. 2009. State of art of saffron (Crocus sativus L.) agronomy: A comprehensive review. Food Reviews International 25: 44–85. Molina, R.V., Valero, M., Navarro, Y., Guardiola, J.L. and Garcia-Luis, A. 2004. Temperature effects on flower formation in saffron (Crocus sativus L.). Scientia Horticulturae 103: 361–379. Moshiri, E, Basti, A.A., Noorbala, A.A., Jamshidi, A.H., Hesameddin Abbasi, S., and Akhondzadeh, S. 2006. Crocus sativus L. (petal) in the treatment of mild to-moderate depression: a double-blind, randomized and placebo-controlled trial. Phytomedicine 13: 607– 611. Nair S.C., Panikkar, B., Panikkar, K.R. 1991. Antitumor activity of saffron (Crocus sativus). Cancer Letters 57: 109–14. Sayari, N., Bannayan, M., Alizadeh, A., and Farid, A. 2013. Using drought indices to assess climate change impacts on drought conditions in the northeast of Iran (case study: Kashafrood basin). Meteorological Applications 20: 115–127.